“The first thing I think about on Super Bowl Sunday is food, not football,” says School of Fish author and Oceana executive chef Ben Pollinger. We can’t disagree with him there (though we do love our football… go Hawks!). Here, he shows us how to make a healthier, meatless version of that timeless game-day party classic: Buffalo wings. For more football-friendly dishes, see our gallery of Best Healthy Super Bowl Recipes. Who knew that the debate over land-based meat would've gotten this polarizing, with high-minded herbivores who avoid critters entirely in one corner and "whole beast" carnivores who demand the entire animal from the nose to the tail in the other? 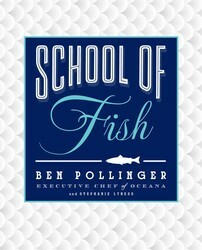 Ben Pollinger, executive chef of upscale Manhattan restaurant Oceana, helps navigate an alternative course in this no-nonsense book that demystifies the art of cooking seafood. With more than 100 recipes organized by technique from the easiest to the most advanced.